Does Twitter sell books? It's a question often asked in the media and on the site itself. The answer is yes. It has to be, or I'd never have bought this one. A few weeks ago a discussion began on the site. Using the Hashtag #dearpublisher, readers were invited to submit questions and opinions to publishers, to get a dialogue going between those that publish books and those that read them. It was a huge success (unlike a similar experiment #dearblogger which apparently descended into abuse fairly quickly) with really interesting points made on both sides. I had mentioned the importance of publishers using sites like Twitter for dialogue rather than simple declaration, and received a response from Chris Hamilton-Emery, Publishing Director of Salt Publishing, who agreed. So we had some dialogue about things and later I came across their campaign Just One Book. Last year, as a small independent publisher, they were facing ruin, but a campaign to encourage readers to purchase just one Salt title and tell others helped them to avoid disaster. This year the campaign continues to help them 'survive and thrive' and I asked Chris to recommend a title from their catalogue after letting him know the kind of thing I liked. This was what he went for, and so I duly purchased my copy and jumped in. Elizabeth Baines is a writer of both fiction and plays for radio and stage (as well as an 'occasional actor' - oh, it's only ever occasional dahling!) 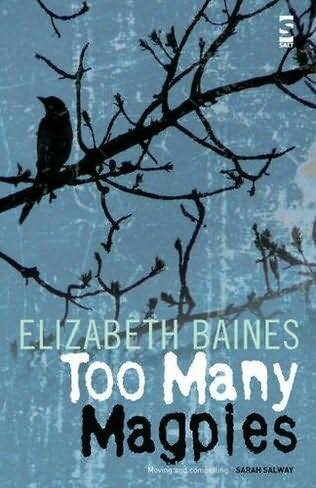 and Too Many Magpies is a novella that looks at superstition, science and infidelity. I was incredibly impressed by what she was able to pack into 123 pages, the economy in the writing coming from focussing on important moments, those that are often accompanied by emotional jolts, allowing Baines to cover a huge amount of plot and incident without it ever feeling overloaded. Our unnamed narrator is married to a scientist and has always thought of herself as a rational person, finding solace and safety in her marriage to a man of certainty. After the birth of her second child she goes through a period of post-natal depression, a name inadequate to describe the debilitating effects of a hormonal reaction. In a moment that echoed the disappointment of reality in Veronique Olmi's Beside The Sea, the family journey to the seaside on a grey day, walking mistakenly towards the estuary rather than the open sea, her children returning from their frolics 'tired and hungry and rattled', hands dirty with oil. Everything shrivelled. It seemed to me then that everything afterwards would be tired and grey. And in that moment of loss I realized what it was all along I'd been wanting. Not quiet science after all, not the steady sanity of rational explanation. Not sane names, but magic ones: lavender, thyme; yes, some kind of blessing, some kind of spell. The day before her baby's first birthday, in the mundane setting of an educational committee room, she meets a man. He remains nameless throughout the book, only ever the mysterious 'he', adding to his mysterious power over her and forever one remove from us the reader. As we crossed the park afterwards, suddenly there were birds again. magpies, dropping out of the trees, like bunting, like Jack-out-of-boxes. They cackled, they seemed hilarious. I said, too sternly, that I didn't believe in charms or spells. He laughed. I saw that his teeth were bad, stained and very full of fillings. He said: 'There are charms and there are charms, and there are spells and there are spells,' and I had no idea what he meant. The sun came out, dazzling and disorientating between the trees. the magpies glistened then, medallion green and alchemy blue. They were watching us sideways, they cocked their heads slyly over their bird-shoulders, waiting, or maybe taunting, it was hard to say. We moved on, and they flapped away into the columns of sun between black tree trunks, still there but suffused and melted with the light. And so an affair begins, although Baines has no interest in describing the details of that so much as its fallout, the way in which it affects her protagonist. In chapters named from the rhyme of those totemic birds (For Sorrow, For Joy, For a Secret, To be Told) we witness the battle between two modes of thought: science and magic. In fact the book opens with an image that throws us straight in. The Smarties on that first birthday cake have gone frilly round the edges. 'Magic,' says her four-year-old and indeed so does 'he', but Daddy is there to explain it away through the science of osmosis. To have lived in a world that is certain and rational and to then have that challenged by fear and uncertainty is what makes it such a bumpy ride for her and Baines also knows that for someone who is both wife, mother and lover there is a constant conflict of interest. Of course there wasn't a spell for this: for splitting yourself down the middle, dividing yourself between your lover and your kids. Your kids are so much part of you; you take your lover with you wherever you go. He breathes in the rain whether he's really there or not, and pricks the children's ears up. Their eyes grow wide seeing his spirit in your gestures and the longing gleam in your eye. As the book develops and she loses more and more control of her life Baines also introduces the theme of guilt. Her narrator may not be in charge but she begins to remember her responsibilities and so make the journey back from the irrationality of her affair to the rational world in which she used to live. I realise that a fair portion of this review is made up of excerpts but the reason for this is that with such a short book, and with such a pleasing lyricism to the prose, sometimes it's best to let the writing do the talking. There are memorable phrases like the 'satirical high heels, and a black silky dress with an insolent cleavage' that she wears to provoke her husband, but most notable is the way in which the writing swoops in and out of moments of emotional importance creating a sense of heightened reality. That makes for a powerful and emotional journey for the reader and one that makes this book an easy one to recommend if you'd like to help Salt and buy Just One Book from them. You can also click on the link above to see the rest of their catalogue which includes poetry as well as fiction. I'm so glad you found Elizabeth! She's a wonderful writer and a great model for what Salt does. I've had the great pleasure of getting to know her a bit through the blogosphere -- and even in person. She's just lovely. Very pleased to have found her Sue, it's a great little book. Best of luck to you today by the way with the beginning of Theatre Souk. I hope it all goes well.